Apple has cut the price of all Apple Music plans in India, in a move apparently aimed at fending off rival streaming services like Spotify and YouTube Music, both of which recently launched in the country within the last month. Apple Music is now being offered for Rs 99 ($1.43) a month, down from the earlier price of Rs 120 ($1.73). Likewise, a student membership now costs Rs 49 instead of Rs 60, while a family plan has dropped from Rs 190 to Rs 149. Yearly subscriptions meanwhile cost Rs 999 rather than the earlier price of Rs 1,200. 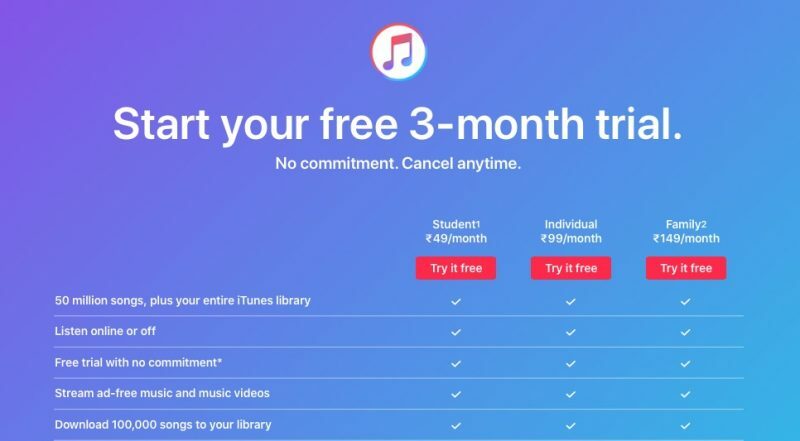 The new price of an Apple Music membership undercuts both Spotify and YouTube Music, whose monthly premium plans start at Rs 119 and Rs 129, respectively. India is seen as an untapped market for streaming music services, with a population of 1.3 billion people many of whom are only just becoming active internet users. Home to a thriving and varied multi-lingual music scene, the country already has several local streaming services like JioSaavn and Gaana, but with the big international players making their debut in the country, competition appears to be hotting up. Are Apple making a profit at this price? If so, are Western European and American customers being ripped off? If Apple are losing money at this price, are we essentially subsidising residents of poorer countries Apple Music subscriptions? I make no judgements either way but I’m curious as to how it works. are Western European and American customers being ripped off? No one is holding a gun to your head and tells you to buy the service. Don’t like the price? Walk away. Nothing like some good old “hotting” up competition. Apple really wants that Asian Market! But that price is incredible! They are aiming for the Indian market specifically not the whole Asian market. they can’t win western market and rest of Asia as competition is very strong in both hardware and services section.Samsung and Huawei are winning /already won the hardware and likes of Spotify and Google,etc winning the software side. But India is different,many f there STILL look at iPhones (and thus it’s services as status symbol and luxury). Also Apple really wants to move iPhone assembly line from China to India to save production costs even further and maximise margins.this way they can also influence Indian market more. The music selection available in India is likely very different than ours. It’s probably flooded with artists and labels who are willing to sell their music for much less. In fact, the trouble is that Apple Music's local collection is actually one of the worst, especially in terms of old songs from back in the 1950 to 1980 range.... an era which a lot of older money-wielding Indians are fond of listening. Apple Music's marketshare is terrible in India, even among iPhone users. And for once, it's not due to price. The local players have a far better Indian music catalog, without any major compromises on international music. I'm sorry, but am I living in a separate reality where the word "SLASHED" means something else? "Apple Music is now being offered for Rs 99 ($1.43) a month, down from the earlier price of Rs 120 ($1.73)"
So from $1.73 down to $1.43 is classed as a price SLASH now is it? If I went into ANY store, which had a sign saying "PRICES SLASHED" on the windows, if I'm honest, I'd expect more of a drop in price difference than that.